Early Chinese bronze seals for official use often had long handles which made it easier for the user to stamp them repeatedly in the course of their work. Since the Ming dynasty, when scholars found they could carve their own seals from soft stone, these handles have mostly disappeared, at least with seals for private use. 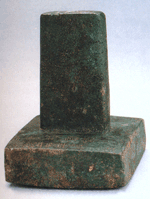 In fact, the shape for a scholar’s seal stone has been reduced to that of a handle—a long rectangle.